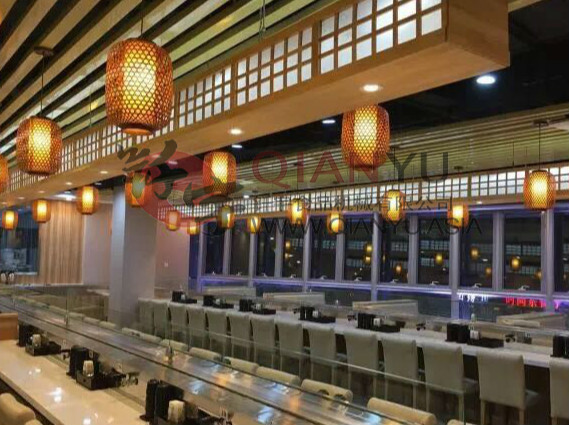 Guangzhou Qianyu Food Machinery Co., Ltd. is a manufacturer of Sushi Belt Equipment, is committed to research and development of various Rotary Sushi Conveyor Belt, rotary sushi delivery equipment. With reliable quality and reliable products, the company has provided many complete High Stablity Sushi Conveyor Belt for the food display industry. It has been well sold in the country and expanded to overseas markets, winning the praise and trust of customers. 2. The conveyor chain runs smoothly, mechanical maintenance can be performed at any time, and the service life is long. 3, transportation guide rail connection position flat, seamless appearance. 5. The rubber strips are made of polymer nylon, which is characterized by wear resistance, no noise, long life, etc. Looking for ideal Freshest And Affordable Conveyor Belt Manufacturer & supplier ? We have a wide selection at great prices to help you get creative. All the Conveyor Sushi Machine Chain are quality guaranteed. We are China Origin Factory of Best Conveyor Belt Sushi. If you have any question, please feel free to contact us.